On 30 August 2007, TNT’s Chief executive officer Peter Bakker launched TNT’s strategy to improve transparency on the company’s carbon footprint, to drastically reduce CO2 emiissions from the company’s operations and to stimulate its 159,000 employees to do the same in their private lives. On 30 August 2007, TNT’s Chief executive officer Peter Bakker launched TNT’s strategy to improve transparency on the company’s carbon footprint, to drastically reduce CO2 emiissions from the company’s operations and to stimulate its 159,000 employees to do the same in their private lives. TNT’s program is called “Planet Me”. Firstly, TNT is installing a certified system to measure, report and manage its CO2 emissions. Secondly, the company is implementing CO2 reduction initiatives in its eight most important operational areas: aviation, buildings, business travel, company cars, partnering with customers, operational fleet, procurement, and investments. Thirdly, the program stimulates employees to use less energy at home and on the road. “There is a strong business case for Planet Me. Customers, governments, our employees and also the general publics increasingly look at how companies respond to global warming," said Mr. Bakker. "As a leader in our industry we feel a responsibility to pro-actively address this”, Mr. Bakker said. “For TNT the challenge of reducing CO2 emissions is tremendous." "Low-carbon technologies for transport are just not available or too costly to implement. Despite these challenges this announcement is the start of our quest to become the first zero emissions express and mail company in the world”. 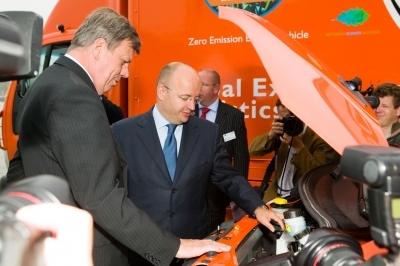 Prior to the announcement of the PlanetMe, on August 21, 2007, Ivo Opstelten (Mayor of Rotterdam and Chairman of the Rotterdam Climate Initiative) and Peter Bakker (CEO of TNT) presented the two Smith electrical trucks which will be piloted in the Rotterdam area as part of the Rotterdam Climate Initiative. The vehicles, a 3.5-tonne Smith Edison EV and a 9-tonne Smith Newton EV, will operate emission free in congested areas. The pilot is a significant step to contribute to the objective to reduce CO2 emissions by half in Rotterdam by 2025 compared to 1990. "This is an excellent example of how innovative entrepreneurship combines environmental profit with economic profit." 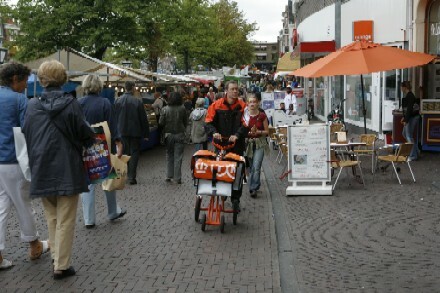 according to Mayor Opstelten. "The Rotterdam Climate Initiative offers support to this type of pilots and a platform to test their business cases. We are proud that TNT chose to team up with us and welcome them as our latest business partner." "Next to raising the necessary awareness and involving stakeholders to address the problems the earth is currently facing, we are both committed to actually undertake action." Mr. Bakker said: "We are very aware of the impact of our operations on the environment and recognise that we contribute to the problem of climate change. Hence, we feel it‘s our responsibility to contribute to a viable long-term solution." "Protecting the environment also makes business sense, as our stakeholders are increasingly evaluating us on our environmental impact. TNT foresees electric vehicles to become a key component for future super-urbanized inner city pick up and delivery networks as more and more restrictions are imposed on emissions in urbanized areas." TNT said the company recognizes its social responsibility in other ways as well. It has formed partnerships with the United Nations World Food Programme and the United Nations Environment Programme to fight hunger and pollution in the world. TNT is responsible for the contents of this article.